AN original RAF Ariel motorcycle from 1942, a Dodge WC52 light military truck and a swarm of Willys Jeeps were just some of the highlights at the 15th annual Military Vehicles Day at Brooklands Museum. 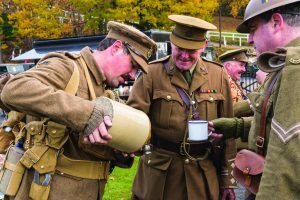 Living History Groups staged displays around the site, including the Royal Union rifles, the 10th Battalion The Essex Regiment A Company, First Aid Nursing Yeomanry and the Royal Military Police. The recently restored Finishing Straight of the original race track was filled with Land Rovers in their varying guises as bomb disposal, radio, fire and support vehicles. Heavier trucks and lorries featured by the Race Bays together with iconic Willys Jeeps. Brooklands’ automotive past was represented with familiar marques adorning military creations such as a 1969 Alvis Stalwart load carrier, 1953 Daimler Ferret scout car and a Humber ‘Pig’ APC (armoured personnel carrier) from 1958. Some of the lighter military vehicles were put through their paces on the off-road course at neighbouring Mercedes-Benz World, while others tackled ascents of Brooklands’ Test Hill. The museum also played host to members of the British Drag Racing Hall of Fame, who arrived in Weybridge recently from as far afield as the United States. Treated to an impressive and noisy demonstration run of the Napier Railton on the re-opened Finishing Straight, there was a tour of the museum and a stint on the F1 simulator, before the group headed off for a Gala Awards Dinner. More speed demons, albeit of a different vintage, were commemorated on Wednesday to mark the 120th anniversary of the very first British motor races organised by the Motor Car Club, which saw historic De Dion Bouton motor tricycles take to a circuit laid out at Brooklands and contest several races.